Another season is out the door and with it came a few rules changes. Here’s hoping this is the last minor rule amendment for quite some time. Play-testing with the 1882 card set revealed some limitations with the Pitching Fatigue rules. The card-making formulas gave a bump to a pitcher’s Endurance rating based on the percentage of games started that they also completed. Without completely exposing the formula, let’s just say that it wasn’t really enough of a bump. With the new numbers, your average 19th century pitcher has a rating of close to 16, which should be more than enough to get them through 9 innings with Endurance left in the tank. Furthermore, a rule has been added so that a pitcher who gets through 9 innings only loses additional Endurance points for each run allowed in extra innings. These two changes combined will help replicate those games of the past when a starting pitcher might go 12 innings (or more) while still keeping it extremely unlikely for a 21st century pitcher to go more than 9. I’d still say to eschew the rules when you feel justified to do so. Meaning this – if you’re playing 1882 games and you know the guy on the mound completed 99% of his starts, then just go ahead and let him pitch 20 innings without fatigue rules if you’d like. This was something else that came up with further play-testing. It occurred to me that the game engine didn’t do enough to manage double plays for certain batters who rarely hit into twin killings. Take the admittedly extreme example of Byron Buxton the last couple of seasons. As you might expect, the OUTS section of his cards for those two seasons have no hard ground out readings. The problem, of course, is that sometimes outs come off of the opposing pitcher’s card. While he’d still end up bouncing into fewer double plays than your average batter, I still felt we could do better. Cue the new rare DP rating. Some batter cards now have a red “DP-#” reading on their cards, indicating that a G1h, G3h, G4h, G5h or G6h from the opposing pitcher’s card may be down-graded to a G1, G3, G4, G5 or G6 in certain conditions. It’s a simple rule, which also gives the added benefit of making a good-fielding middle infielder more valuable. Now, if a guy with a “DP-5” like 2017 Buxton rolls up a G6h off of the opposing pitcher’s card, you’d check the pivot man’s fielding rating – in this example, the second baseman. Unless he’s a 2B-5, that result is changed to a G6. Interestingly enough, the only AL second baseman with a 5 is Buxton’s teammate, Brian Dozier, so you’re probably not going to see a 6-4-3 turn up! However, there were a pair of AL shortstops with a 5 – Andrelton Summons and Jose Iglesias – the latter of which is right there in Buxton’s division, so you’ll still get a chance at a 4-6-3 somewhere along the line. Remember, we’re looking to find a way to get him to hit into roughly one double play all season long, so it should be almost impossible for him to bounce into one. 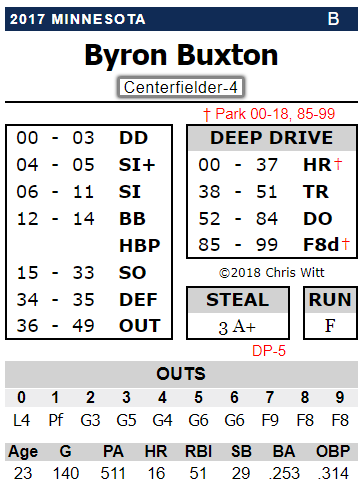 In short, the pivot man must have a fielding rating equal to or greater than the number following “DP-” in order to complete the double play on the batter. I spent a lot of time this month diving into research on bunt efficiency. It revealed some short-comings with the old bunt charts on Deep Drive Baseball. Again, I felt I could do better. Bunts tend to work as planned only about 2/3 of the time (or less) and, contrary to what I originally thought, pitchers aren’t actually more efficient bunters than position players. So if you find a game that routinely gives better Bunt ratings to pitchers than position players by virtue of their having more sacrifice hits in their stats, you should be suspicious. The old charts probably had bunts being successful about 80-90% of the time and that was excessive. Besides bringing the success rate on bunts closer to that 60-65% range, the new charts have a few other new features to them that I think spice up the game engine. Chief among those features is that batter/runner speeds as well as fielder ratings play a larger role in the success/failure of a sacrifice bunt attempt. For example, something that was virtually non-existent in the old rules but is now added in is that play where the Defensive Manager faces the choice of whether or not to try for a runner or just go for the batter. You’re in the field with a one-run lead in the 8th inning, one out and a runner on 3rd. The batter drops a bunt that’s fielded by your first baseman. Do you throw home or toss over to first base and retire the batter, conceding the run? Well, now there will be plays where there are plenty of factors to consider. Is your first baseman a weak “2” down there? Or is he a Gold Glove-type “5”? Is the man coming down the 3rd base line a S runner? Or is he a VF who’s leaving a trail of smoke behind him? Here’s a link to the Bunt Chart for Rules 1.6 in both full and QuickChart layouts. Honestly, I don’t like making rule changes. I’d like to have the rule book just stay as it is, but at this point it’s a bit more of a living, breathing document. But carding a 19th century season, rolling a ton of games, and coming across some interesting research articles all converged on a few things that I thought could be implemented to help make Deep Drive Baseball a better product. If you have any other suggestions or comments, please feel free to post them here or reach out directly to me.